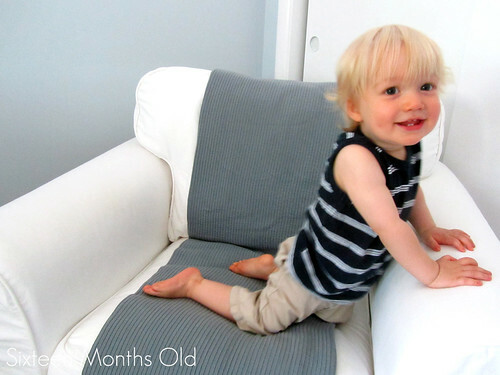 The A & B Stories: Benjamin - Sixteen Months! I gave up early this time. I think this was the best I was going to get anyway. It's such a perfect picture to convey what life with Ben is like these days anyway. HE DOESN'T STOP. He also has decided that he hates all food, sleep, being carried, not being carried, and being told that he can't put something in his mouth. The only thing he continues to love....The Bubble Guppies. Bless them on days when I need five minutes. He is a Duckworth, so offer him a book or some paper to eat. Hehe. happy 16 month birthday kiddo! isn't it funny how they seem to change overnight? it sounds like Ben and J have something in common...hating everything mom wants them to do ha ha if its any consolation they get through this phase...but its usually followed by another one that's equally as unpleasant. hahaha, I just did a post about how hard it is to get a shot at 9 months! Something tells me I will not last until 16 months. What a cutie. My niece is obsessed with bubble guppies too, I'm not sure if I should be excited or not excited for when Alice takes an interest? ?